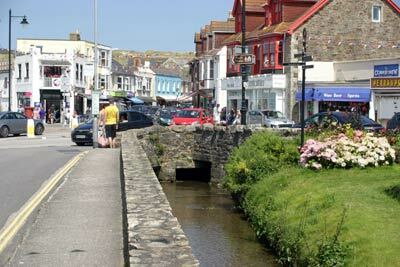 Thousands of people a year come to visit the stunning Perranporth village and beach. Perranporth Beach and Perran Sands, at low tide are a vast expanse of level sands that stretch along the coast for 3 miles. 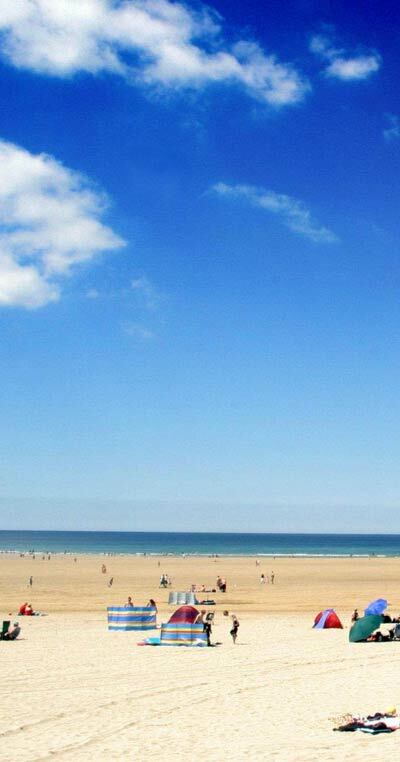 Lying just 6 miles south west of Newquay, the beach is extremely popular with all age groups, from families looking for relaxing days on the sand, to surfers chasing the swell of the Atlantic surf. 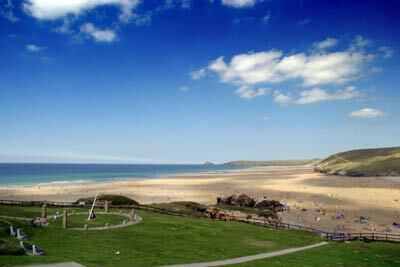 Perranporth is an excellent clean beach, which is actively cleansed every day throughout the summer. The beach is vast and flat when the tide is out which means quite a walk to the sea, but for the little ones, a clean stream runs through from the village onto the beach, along the foot of the cliffs into the sea. The stream being shallow at Perranporth means the sun gently heats the water, making it very relaxing to paddle in. Alternatively, when the tide is in, the sea again is shallow, being very safe for families, though supervision is always supervised. Perranporth beach is highly popular during the summer, and the sections nearest to the village fill up very quickly - in part due to their ease of access and proximity to the nearby amenities of Perranporth itself. The right side of Perranporth Beach is fringed by a Sand Dune system, which provides a varied habitat for butterflies and lizards amongst the clumps of marram grass and a perfect place for the explorers in the family. The fine, wind blown sand, that creates this system, creates the perfect beach for families. So the eastern edge of the beach with its ease of access and fine sands become very popular on warm days. To the left, Perranporth Beach is flanked by a line of cliffs that give provide some shelter to the beach from prevailing winds. Perranporth Arch is the most well known feature of this section of the beach - formed by wave action eroding a hole in the cliffs to form the spectacular "Arch Rock". Food and drinks are available; right on Perranporth beach. The Watering Hole serves drinks from juices for the children or the finest lagers, ales and spirits for the adults. Sit outside on the beach garden and enjoy a Sunday carvery throughout the winter seasons and a beach BBQ in the summer seasons. Other foods are available, so why not check out the menu. The Watering Hole also has live music throughout the year. To keep the kids entertained, on the village side of Perranporth beach there are trampolines which are supervised, and for all the family to enjoy, during summertime, you may be able to watch a game of beach cricket, again which is professionally organised. As Perranporth beach provides the perfect conditions for Kite Surfers and Kite Land boarders allowing them to follow their adrenalin fuelled sports, you will see many of these darting around the shore. If you're sat there watching and fancy a go, why not book in with the Mobius Kite School, located on the beach of Perranporth, offering lessons. Power kiting is also a big favourite on Perranporth beach where again, lesson can be booked for the more enthusiastic people. Perranporth beach is manned by lifeguards between the summer months of 31st March through to 30th September and also Easter time. Dedicated "safe" swimming areas are indicated clearly along the beach for everyone's safety. Perranporth is a dog friendly beach so all the family can enjoy a day out at Perranporth. Dogs must be kept on leads between July and August, 9am - 5pm. Toilets are on the beach edge, as is the Lost Child Centre and First Aid post that are manned by the local lifeguards in case of any emergency. 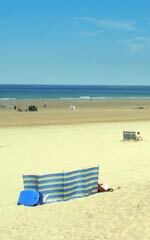 Deck chair hire is available from the edge of the beach, and also Surf hire, including surfboards and wetsuits. The surf school is on your entrance to the beach. The village of Perranporth is 'dainty' yet has everything it needs, with all of the usual seaside shops, and general stores, selling all the things you'd need for your day out to the beach. There are many places to eat, which serve food ranging from the traditional Cornish, pub food, to Italian and seafood restaurants. 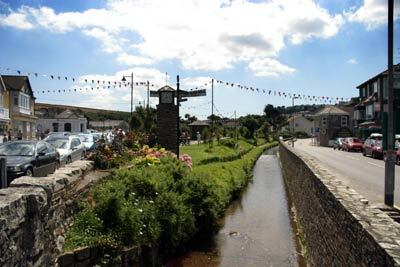 Running through the centre of Perranporth Village is a small stream that feeds onto the beach, which sometimes you can spot some sea trout.